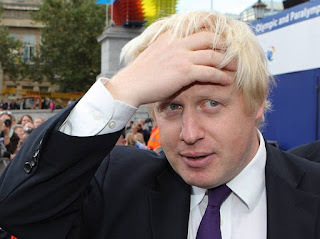 If anything happening in London right now were to encapsulate the sheer uselessness of its increasingly occasional Mayor Alexander Boris de Pfeffel Johnson, it had to be the plight of the black cab trade, whose members - self-employed small business folk, remember - have to spend years getting their licences, and must provide a fully accessible vehicle for their customers, but are now facing incursions from the likes of Uber. Those who use the Uber app to make their living need not do The Knowledge; all they need is a Prius (or similar) and satnav. Their ultimate leader, Uber CEO Travis Kalanick, has shown just how interested he is in free competition: taxi services are mere “assholes”, and the dirty tricks Uber is prepared to use in order to hobble the competition are fast becoming the stuff of legend. So where is Bozza when London’s cab trade wants to talk to him - after all, as Mayor, he is ultimately responsible for Transport for London (TfL), who oversee cabs and private hire minicabs? The short answer is that he is elsewhere: Bozza wants to be loved, and tires easily of problems like Uber. The cabbies do not, right now, love their Mayor. 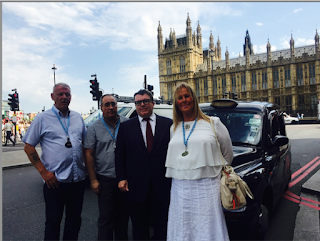 So it came to pass that Labour MP Tom Watson decided to talk to the capital’s cabbies. Think about that. Watson represents West Bromwich East, which is some 120 miles from London. The Mayor, on the same day, was glad-handing fellow politicians and journalists at the Spectator magazine’s summer party. One might be forgiven for drawing the conclusion that Bozza cares less about his mayoral duties than being the centre of attention at a suitably fashionable piss-up. Watson has written to Johnson, pointing out that he, not a Labour MP from out of town, should be the one on the case. The text of the letter I reproduce in full below. “I have today met with Trevor Merralls (Campaigns Manager), Angela Clarkson (Secretary) and Len Martin (chairman) of the United Cabbie Group. As I’m sure you know, UCG is the fastest-growing trade organisation for black cabs in London. They told me of their increasing frustration at the failure of Transport for London (TfL) to deal with their legitimate concerns about Uber and TfL’s role as a regulator of taxi and private hire services. I cannot be the only worker in London who is concerned about the increasing disruption to London's transport network by taxi drivers who feel they have no choice but to demonstrate because their concerns are not being taken seriously by TfL. I'm sure it will not have escaped your notice that two Uber executives in Paris were this week indicted on charges that range from running illegal taxi services to illicit storage of personal data. And you will also have read reports from America that suggest a senior executive at Uber said that the company should consider hiring a team of opposition researchers to dig up dirt on its critics in the media — and specifically to spread details of the personal life of a female journalist who has criticised the company. You are a busy man but you are the person in charge of London. I'm sure with a bit of wisdom applied to this problem, a way forward can be found. I have asked United Cabbies Group to postpone their planned future actions. They have considered my proposal that they do so, in return for helping them get their legitimate concerns heard by a senior politician. Looking at this from all sides, that senior politician is you. Please take personal charge of this issue and deal with it. If you would like me to broker talks, I'll do whatever I can to help. The photo above shows Tom Watson with the representatives of UCG outside Parliament. It should be a source of abject shame to any half-credible politician that those they represent have no option but to turn to an MP from over 100 miles away to get themselves heard. But, as it’s Bozza, he’ll probably emerge from this latest heap of horseshit smelling of roses. Worse, his press pals, some of whom were supping with him at the Spectator party the other night, will excuse him and kick the cabbies instead. That, it cannot be stressed too highly, is not good enough. Uber is now operating in Leeds, but it appears rules don't apply to them. The taxi I saw yesterday was an 07 reg, therefore registered between 1 March and 31 August 2007. Thinking this appeared old for a private hire I have done some research. "Only vehicles up to five years old will be licensed. Vehicle licences will normally only be renewed up to seven years old i.e. the last licence a vehicle will be granted will be prior to its seventh year." This vehicle is now 8 years old. Uber has only been operating in the city since the beginning of this year. Therefore this vehicle was either licensed whilst over 5 years old, or was operating illegally. Needless to say I'll be keeping an eye out for this particular private hire vehicle and asking questions of the Council. Bozo and the Specky......a marriage made in pig sty purgatory. This isn't the first time we've had this cab shite in Lahndan. Way back in the mist-shrouded Sixties minicabs made an appearance and there was actually physical violence. Let's face it, SatNavs are no more going to go away than are the requirements for taxis. Equally, the so-called "Knowledge" is now obsolete, not required, a dead parrot. Computer data bases have now largely replaced memory in every field. They are a fact of life. It is also a fact that the situation requires grown-up talk and compromise all round by EVERYBODY. Which is one good reason why Bozo and Uber thugs are superfluous. Not that I could give a dump if Lahndan chokes on its own carbon monoxide or not. But they HAVE got it coming. Boris is much too busy to meet cabbies, he's working hard to maintain the double the legal limit pollution level in London. "As I’m sure you know" equals "As I know you haven't got the slightest clue.."